Arthritis There are no products in this category. Arthritis is a condition of the joints that often accompanies aging, and as such, a significant number of dogs that live to maturity will develop arthritis at some point in their lives, although it is by no means exclusively a condition of old age. Arthritis is an inflammatory condition that leads to swelling of the joints in various parts of the body, which in turn causes stiffness, pain and a reluctance to exercise and move freely. Gentle exercise and movement can actually help to lessen the pain and associated symptoms of the condition, however, and so it is important to do what you can to keep your dog mobile for as long as possible. In this article, we will look at arthritis in dogs in more detail, including examining the various causes for it and how it can be treated. Read on to learn more. There are two different types of arthritis that can affect dogs, known as inflammatory and non-inflammatory respectively. Non-inflammatory arthritis causes a gradual degeneration of the tissue of the joints, but does not lead to fever or other whole-body effects that can cause the condition to become systemic. Inflammatory arthritis can be either infectious or immune-mediated; infectious arthritis happens due to bacteria invading the joints and causing inflammation, while immune-mediated arthritis occurs when the immune system of the body is out of balance, leading to joint damage. As arthritis comes in various different forms with different degrees of severity, a range of different factors can serve to cause or exacerbate the condition. Once of the biggest risk factors for causing or worsening arthritis is obesity, as carrying additional weight around also places additional strain on the muscles and joints of the body, worsening any potential problems in the making. Arthritis often has a hereditary element to it as well, and dogs that are apt to suffer from conformation or bone and joint problems such as hip dysplasia are also exponentially more likely to suffer from arthritis in later life too. As mentioned, weight can play a large part in the development of arthritis, or how severe the presentation of the condition is. Monitoring your dog’s weight and ensuring that their food intake is matched to their exercise levels and suitable for their life stage can help, and ensuring that your dog stays fit can also ensure that the joints and muscles stay strong and healthy into old age. Injuries such as fractures and broken bones can also lead to the development of arthritis, and so care should be taken to avoid such injuries where possible. 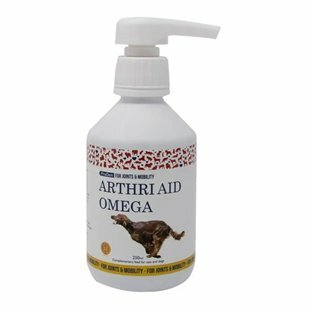 Certain supplements and vitamins such as Seraquin for dogs with glucosamine and chondroitin given from an early age can also help to slow the onset of arthritis and support healthy joint function, although you should speak to your vet before you begin adding any supplements to your dog’s diet. If your dog is appears to be suffering from stiff joints, pain, inflammation or difficulty moving, it is important to get them checked out by your vet to receive a formal diagnosis of their condition, and help with how to proceed. What type of arthritis your dog is diagnosed with and how severe it is will affect how the condition can be managed, and the progression of your dog’s condition should be reviewed by your vet regularly to see how your dog is getting on. Hydrotherapy is one of the most popular drug-free ways of easing the symptoms of arthritis in dogs, as swimming allows the whole body to move freely while being supported in low-impact exercise that helps to build muscle tone and contribute to healthy bones and joints. Many dogs that are diagnosed with arthritis will also be prescribed medications to help them to cope with the condition, either on an ongoing basis, or as and when needed when the condition flares up or is particularly acute. Generally, anti-inflammatory drugs that work to reduce both pain and swelling are the best choice for canine arthritis, and some of the most commonly prescribed medications for canine arthritis include Metacam, Rimadyl and Carprieve. These medications are usually prescribed for short term usage, when your dog’s symptoms are particularly pronounced. As is often the case with people who suffer from arthritis, changes in the weather and temperature can cause the condition to flare up, and very cold weather and periods of rain are when your dog is the most likely to suffer from the condition. Ensuring that your dog can stay warm and comfortable is important in easing the condition, as is administering anti-inflammatory medications and pain killers when indicated to help them to stay mobile. Keeping your dog active and encouraging them to walk gently even when the condition is acute can help to ease the symptoms of canine arthritis, and in combination with medications, this is generally the best way to proceed for affected dogs.